Fishing with Come Fish Panama off the Northwestern Coast of Panama this week were father and son team of Mike and Donny J. from Ft. Myers, Florida. 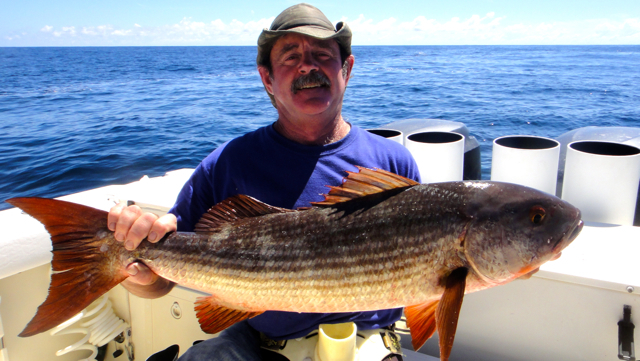 Mike and Donny are avid anglers, having spent countless hours along the Gulf coast of Florida targeting Cobia, Tarpon, Snook, Gag Grouper and Spanish Mackerel, to name a few. Just prior to heading offshore, we asked them if they had a specific species they were looking to target and the reply was “we just want to get hooked up”. With that said I put together a plan that would maximize what they would experience with regards to techniques, equipment and species. We were greeted with a beautiful sunrise over the Pacific as we made our way out to our first spot. Current and sea conditions were perfect and the water clarity and color promising. Seas were so smooth that we had to bump up our trolling speed just a notch in order to give our lures a little extra action to get us a quick bite. As we have reported during these past few months, the Dorado bite, or Mahi as they are called in this part of the world, has been on fire, especially during the early hours. They seem to be everywhere. These beautiful fish are natural acrobats and tough fighters, especially on light tackle. Our anglers love to watch them leap all over the place as they try to throw the hook and escape. Today would be no different. 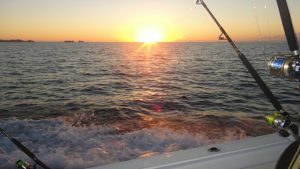 After hooking, fighting, boating and releasing over a dozen Dorado, we decided to move on in pursuit of other gamefish. I am not exaggerating when I say that we could have remained on this hot bite all day long and hooked up over 30 fish. What a blast! Providing anglers an opportunity to try different equipment and techniques is very satisfying. Imagine them sitting around the table with friends sharing their fish stories but being able to relate the equipment and technique to each species caught. Fishing is exciting in it-self, but spice it up a bit by changing the “tools” and you get a totally different experience. We took out 3 different rod/reel combos for them and started to attack the bottom dwellers. Mike and Donny were hooked up time and time again. And of course, you usually never know what’s at the other end of the line until you see color. The truly experienced anglers may have a better guess than the rest of us based on where the fish was hooked and how it’s behaving, but it’s still a guess. In this great spot, Mike and Donny caught Snappers, Jacks, Trigger Fish, Skipjack Tuna, Rainbow Runners and an Oceanic White Tip Shark on light tackle. 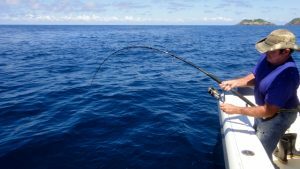 With Come Fish Panama, it’s all about bending a rod and creating fishing memories in this living treasure chest we call the Gulf of Chiriquí. After a successful day on the water, our happy anglers Mike and Donny thanked us all the way back to the dock with grins from ear to ear. We would like to express our sincere appreciation to them for giving us the opportunity to take them out fishing and getting hooked up with so many species. We look forward to having them back in 2013. To view more photographs of these and previous anglers in action, feel free to visit our fishing photo link on the website.